Coventry University has yet again responded to a legitimate and legal request from its staff for union recognition with shameful union-busting tactics, this time in its wholly owned teaching ‘super-subsidiary’, the CU Group. After a three year campaign to get the University and College Union (UCU) recognised for collective bargaining in the CU Group – which includes ‘no frills’ higher education campuses in Coventry, Scarborough and London – union representatives found out that the employer had instead recognised its own staff consultative forum as a trade union, preventing UCU from applying for statutory recognition. In response, UCU has launched a national campaign which has so far included local media coverage, letters from local politicians and trade union branches across the UK to the vice chancellor, an impressive protest on graduation earlier this month, and an early day motion to Parliament from Coventry MP Jim Cunningham. UCU say that they will not stop until the university’s ‘sham union’ is de-recognised and UCU recognised in its place. On the 16 May (3pm), the union will be holding another national protest, this time to coincide with a Coventry University Board of Governors meeting. Exploiting a loophole in UK charity law, Coventry University has pioneered the use of subsidiary companies to engage in profit-making activities and subvert existing collective bargaining and national framework agreements. Although perfectly legal, such profit making subsidiary companies are not supposed to be used to engage in the charity’s primary objective, in this case education, but are rather designed to help the charity make some extra money to better achieve the primary objective. As the university proudly boasts, its for-profit teaching subsidiaries, now brought together within the ‘super-subsidiary’ the CU Group, offer ‘no frill’ HE at £6000 per year. According to UCU, it does this by pressing down on the terms and conditions of its staff, paying de-professionalised tutors less than their Coventry University equivalents, and offering only the minimum of holiday, sickness and pension contributions. In a letter to The Guardian newspaper earlier this year, UCU general secretary Sally Hunt wrote: “Let’s be clear about what “no frills” actually means in this context. Coventry University College, or CU Coventry, as it’s now called, charges lower prices for its three-year degrees and claims to offer students a more flexible experience. “But if you teach at CU Coventry – a subsidiary of Coventry University – “no frills” means you get paid much less than your colleagues at the university, your teaching year is much longer, your workload heavier, and you have no access to a decent occupational pension. “About 40 per cent of the teachers are paid by the hour and this “sweating of the assets” means there is a heavy turnover of staff. “All of which helps to explain why these teachers are fighting hard for a union. Their colleagues at Coventry University can be in a number of unions that are recognised by the university. “Appallingly though, the board of governors at CU Coventry decided recently to resist any approaches from unions at the college. “CU Coventry’s “no frills” model is highly profitable. In 2016 it registered post-tax profits of £3.8million which it then gift-aided to its sole shareholder, Coventry University. “The CEO of CU College is the pro-vice-chancellor of Coventry University and the board includes two deputy vice-chancellors and the university secretary. The Coventry University UCU branch has for three years now been campaigning for UCU recognition in Coventry University’s subsidiary companies. In 2016, UCU successfully balloted staff in professional training subsidiary CU Services – where English pre-sessional teachers, who had once been employed as Lecturers in the main University, had been ‘outsourced’ the year before – achieving an impressive result: 100% of respondents wanted UCU to be recognised for collective bargaining with 76% of staff turning out to vote. However, just a few weeks after UCU secured recognition, CU Services Ltd announced that it was “reviewing its business model” and sacked many of its staff. These staff were told that if they wanted to continue doing the same work, they would have to register as agency workers with a company called thefutureworks – a trading name of Coventry University Enterprises Ltd, also wholly owned by Coventry University. Coventry University insisted that its subsidiary companies were autonomous and made their own decisions. However, the companies have only one shareholder, which is Coventry University, while their directors include senior university officers and members of Coventry University’s board of governors. Until October 2015, vice-chancellor John Latham sat on the board of CU Services Ltd.
“Running through the debate around Sports Direct is a comforting, dangerous delusion. It is that such horrors are never visited on People Like Us. Victorian workhouses? Staff so terrified of losing their jobs they dare not protest their abuse? Terrible – but (guilty whisper) it only happens to the low-paid and the low-skilled, at dead-end jobs and in left-behind colliery towns. Right? After this national coverage, and the threat of a protest on a major Open Day for prospective students and their parents, the University reinstated these English teachers on their original contracts. Meanwhile, UCU had also been campaigning in another subsidiary, then called CU College, now CU Coventry and subsumed within the ‘super-subsidiary the CU Group. Two years later, UCU finally had the numbers to apply for statutory recognition through the Central Arbitration Committee, and met with the employer to notify them only to find out that the CU Group has recognised its own staff consultative forum instead, which under trade union law meant that UCU could no longer go through the statutory process. Even worse, UCU later found out – through a freedom of information request for the minutes of CU Group board meetings – that the CU Group had discussed this option explicitly as a way of preventing UCU recognition as early as 2016. Sally Hunt responded: “These shameful dirty tricks by the Coventry University Group are designed to deny staff their right to proper, independent trade union representation. “Staff have made it quite clear that they want to be represented by UCU. “The management needs to respect the wishes of staff by scrapping the sham union, confirming they will recognise UCU now and granting the union proper negotiating rights. From the beginning, the campaign against union busting at Coventry University has had the support of local MP, Jim Cunningham, who within days wrote a letter to the vice-chancellor, John Latham. “The approach taken shows a worrying disregard for the wishes of CUG staff and their right to meaningful collective bargaining on the issues of concern,” Cunningham pointed out. The next MP to wade in was Jack Dromey, Labour MP for Erdington, who also wrote to the VC outlining his concerns about efforts to “deny staff their expressed will and thwart their legal right to a union. “This appears to have been a deliberate and planned move on the part of the Coventry University Group to exploit the law and deny staff their expressed will and thwart their legal right to a union. “I find it deeply concerning that Coventry University, a major employer in the West Midlands, should take such an apparently hostile stance towards trade union recognition. “I note that UCU have launched a petition calling for full recognition of the union which has received almost 10,000 signatures. Other notable interventions have come from local councillor John Mutton, who up until recently worked with John Latham on the Coventry and Warwickshire Local Enterprise Partnership (LEP), and UCU branches all across the UK. Jim Cunningham MP has, after receiving no response from the VC, submitted an early day motion to Parliament, which at the time of writing has over 20 signatures. On 18 April, Coventry University UCU held a regional protest on a postgraduate graduation day, with over 150 people turning up to show solidarity with CU Group staff, including the UCU vice-president Douglas Chalmers. Another demonstration has been called for 16 May – to coincide with a meeting of the Coventry University board of governors – this time a national protest that will hopefully see even more people express their anger at the shameful union-busting practices of one of the UK’s leading modern universities. Coventry University has been claiming that they have offered to negotiate with UCU, with representatives telling the local media that they “have always made clear that we’re open to continuing talks with UCU”. “We believe the protest was misguided and unnecessary because we have agreed to meet with UCU to discuss their concerns in a positive and constructive manner on multiple occasions. “Instead, regrettably, we feel UCU has embarked on a negative and misleading public campaign and reneged on commitments made to us. However, UCU has issued a clarification that disputes this claim, pointing out that as yet, the University has put nothing definite on the table and that trust between staff and the CU Group is non-existent. “Coventry University needs to stop spinning and demonstrate it actually wants to get this sorted,” a spokesperson from UCU said. “They can stop it all immediately by simply agreeing to recognise UCU. “We’re happy to meet any time to discuss how an agreement will work but we’re not going to suspend the campaign until they confirm that they will recognise us, now, in line with our statutory rights. “We’ve asked the university to confirm this, in writing, repeatedly since March 8 and they still won’t do it. The previous instalment of this multipart review of David Willetts’ ‘A University Education’ began to analyse the conversion of quality into quantity that is a necessary part of the process of marketisation, beginning with one of the two main functions of the university: education. Part 4 – which was originally published on Monthly Review Online – follows this by looking at how this process unfolds in relation to research, the other core function of the modern university. Specifically, this instalment examines how the ‘impact agenda’ in UK research policy institutionalises within universities a form of ‘scientific management’, the purpose of which is to break down and rationalise the labour process of academia so that a surplus can be created, which can in turn be put towards the expansion of the university as a transnational corporation (TNC). When it comes to research, Willetts is far more interested in R&D – the kind of ‘useful’ knowledge needed for innovation, i.e. the organic expansion of the global capitalist system – which he thinks has been forgotten within the market reform of English higher education, that he led as Minister of State for Universities and Science between 2010-15. However, since stepping down as Minister – being replaced first by Jo Johnson and now by Sam Gyimah – the UK government has announced it will create a Knowledge Exchange Framework (KEF) to complement the REF and the TEF (Teaching Excellence Framework). Although the creation of the KEF is still in the consultation phase, it is clearly meant to address this area of university output that Willetts thinks has been forgotten. Willetts’ arguments concerning R&D are extremely important, and will be covered in a later instalment of this multi-part review. This part is chiefly concerned with the REF, and the way that it complements the TEF within an overall process of rationalisation necessary for both the corporatisation of the university and the marketisation of the sector. Willetts criticises the REF for its role in incentivising competition over collaboration, and in reproducing the ancient hierarchy in HE based on ‘star researchers’ and traditional university dominated league tables. His vision of competition – which I’ve been arguing in this series is pure neoliberal ideology – is, in contrast, one of driving disruptive competition through the system via new, teaching-only for-profit providers, breaking up this system and replacing it with a consumer- and business-focused marketplace driven by price signals. On this basis, Willetts argues against A. H. Halsey’s thesis in ‘Decline of Donnish Dominion: The British Academic Professions in the Twentieth Century’ that research performance management – first introduced in the UK in 1985 through the Research Assessment Exercise (RAE) – would lead to a decline in the power of academics. As with many of Willetts arguments – which is why this extended critique of his book is important – they hide a deeper truth about the material changes taking place within marketisation. What Willetts is pointing to, while obscuring, is the ‘centre-periphery’ model of de-professionalisation – with relatively secure academics producing research which is then ‘delivered’ by a growing army of casualised ‘tutors’ with no research responsibilities – that is a necessary part of the ‘corporatisation’ of universities as higher education is subsumed into the global monopoly capitalist system. Through what John Holmwood analyses as a process of ‘commercial enclosure’, the research produced by star professors – who, exactly because they believe in knowledge as a public good and provide their research online under ‘open access’ licenses – is used by these education corporations as the teaching material for massive online open courses (MOOCS). Although initially free, such courses can be monetised either by offering pay-as-you-go accreditation – perhaps through established university ‘partners’ – or through advertising, which would ‘pop up’ within courses. For students-as-consumers who desire some face-to-face contact, deprofessionalised ‘tutors’ following pre-prepared lesson plans can deliver workshops, much like minimum wage Costa coffee baristas can deliver a standardised cappuccino after completing a short course. On a micro level, this process is mirrored by the rationalisation and quantification of the academic labour process itself within the ‘impactisation’ of the REF. Just like teaching quality is measured by proxies and rated numerically in the TEF, an essentially social relation between researcher and research subject is converted to a measurable outcome by ‘impact case studies’. Therefore, at an institutional level, both TEF and REF function as Taylorist mechanisms of scientific management, where top down government level objectives – themselves driven by the wider economic needs of neoliberal capitalism – are met by bottom up processes of rationalisation. As Willetts points out, within the British ‘dual support’ system of research funding, the Higher Education Funding Council of England (Hefce) provides about £1.6bn of ‘block grant’ funding directly to universities – which is “more likely to be used for blue skies research” – with the UK Research Councils also providing funding for specific research projects and programmes directly to researchers and research projects (p. 104). The other strand is quality-related (QR) research funding, allocated through a ‘periodic assessment’ called the Research Excellence Framework (REF). There has been one REF so far in 2014 – often referred to as REF2014 – with the next one taking place in 2021. The first ‘specific valuation’ – or performance management system – was introduced by Margaret Thatcher. The Research Selectivity Exercise (RSE) in 1986 began a long process of incentivising first internal and later sector-wide competition in research, undermining the autonomy of academics in evaluating research and destabilising local balances between teaching and research. For Willetts, the REF has in fact had the effect of “strengthening” the power of well-established professors, who by playing the game of the REF – “calculating how much funding they individually bring into their university” (p. 105) – become “star researchers”. These professors, who have already accumulated a certain amount of research power over their careers – especially if they work at elite institutions like Oxford or Cambridge – gain leverage with universities desperate to win as much funding as possible while maintaining their position in rankings, and can enjoy tenure-like security and benefits. According to my own analysis using Higher Education Statistics Agency (HESA) data, the proportion of academic staff on insecure contracts – including ‘a-typical’ and fixed-term’ contrast types – stood at about 50% in the academic year 2015-16 (see Figure 1). This situation is not just difficult for people on such contracts – not knowing whether there will be a job in the future and not being able to plan ahead – but also causes ‘inefficiencies’ in the research process itself – according to UCU “around a third of contract researchers estimated they spent 25% of their funded time working towards their next contract, time that could have been spent on the research they were contracted to conduct”. For many who went to university just before 2008 (including myself), remaining in higher education – especially for one more year as part of a Masters degree – was a way to avoid the immediate effects of the crisis and distinguish oneself from others in an increasingly competitive job market. So we see, in Figure 2, a significant rise in the number of students choosing to stay in full-time education after completing undergraduate degrees, assuming that the majority of people studying at postgraduate level do this as a continuation of study. The increase is particularly marked with taught postgraduate programmes – Masters degrees – but a slow but steady increase can also be seen with research degrees (Ph. Ds). Ursula Huws points out that after the 2008 crisis – although this has been a long-term trend within neoliberal government policy – public services presented such an opportunity for capital accumulation, if they could be privatised or procurement contracts ‘outsourced’ to private capital. As these services have for decades been provided by the state – with labour within such sectors enjoying relatively secure employment, decent pay and generous pensions as a result of strong trade union density – for these public sectors to be integrated with the global monopoly capitalist system they must go through a directed and often forcible process of privatisation. As Marx explained in Capital Vol 1, the ‘reserve army of labour’ is not only an effect of capitalist crises, but also a precondition of renewed accumulation. This reserve army provides an increasing number of desperate and mostly unionised workers to occupy the new, outsourced, deprofessionalised jobs while reminding those lucky enough to retain work that they can be replaced if they dare to cause trouble. As argued in Pt 2, Massive Online Open Courses (MOOCs) provide a way for universities to drive down costs, by replacing expensive teaching labour with online videos and activities. Modern universities – which were given private sector like corporate form in 1992 – have used ‘wholly owned subsidiaries’ to circumvent local and national collective bargaining agreements to offer “no frills” education to finance rapid expansion and get ahead of the coming monopolisation of the sector. Crucially, this process also drives a wedge between the teaching and research function of the university – so important for Humboldt’s vision of the modern university in the 19th century, which has become the model for all universities today across the world – allowing the academic labour force to be split asunder and the integrity of the academic labour process itself to be rationalised and more importantly, managed. There are two kinds of open access (OA), he explains: ‘gold’ OA, which is free at the point of access and is usually paid for through ‘article processing charges’ (APIs), either by academics themselves or by institutions employing these academics; and ‘green’ OA, in which research is placed in a repository after being accepted by a publisher and is open for viewing in the repository alongside publication, usually after an ’embargo’ period. In 2012, the UK government-sponsored Finch Report supported the case for open access, recommending that if possible academic research should be made available to the public through the ‘gold’ route. This recommendation was taken up by Research Councils UK, which established a block grant for open access to be paid directly to institutions according to their research output and made it a requirement that all RCUK funded research should be made open access, either through ‘gold’ or ‘green’ routes. Holmwood, however, rightly asks why RCUK didn’t stipulate that such open research, whether made available through green or gold OA, should come under a non-commercial license with a ‘share-alike’ clause – for example the Creative Commons CC-BY-NC-SA license – as this would at least “require negotiation of commercial use for publications and retain intellectual property rights in the format of publication”. Holmwood links this danger to the project of ‘opening up the system’ of English HE to the competitive challenge of ‘alternative providers’ (see Pt 1) – teaching-focused for-profit universities and colleges – in particular within the Silicon Valley inspired theory of ‘unbundling’, put forward by Michael Barber (now chief executive of the Office of Students) and colleagues. In an influential paper, ‘An Avalanche is Coming: Higher Education and the Revolution Ahead’, Michael Barber (who has now been appointed chair of the Office for Students) and colleagues argue that the traditional model of higher education, linking teaching and research – “so obvious that [it is] taken for granted” (pp. 5-6) – is no longer relevant, and that universities need to ‘unbundle’ the functions of the university. Rather than trying to combine all the functions of higher education under one roof – as with Clark Kerr’s quintessentially modern idea of the ‘multiversity’ – if existing universities want to ride out the gale of creative destruction caused by the entry of technologically-enabled for-profit ‘disruptors’, they should divest from expensive activities like research and concentrate on finding their ‘unique selling point’ (USP). In this somewhat dystopian vision of the future of higher education, as with all capitalist-ideological utopias, the reality of class is ignored. As Holmwood points out, it is not the elite, research-intensive Russell Group and Oxbridge universities that are subject to disruption. These institutions are protected by decades and centuries of accumulated cultural capital – and financial capital coming from alumni donations – it is the modern, ex-public universities that must be restructured. For post-92 universities “that fall between the elite and for-profit providers”, the same model that provides a way in for multinational educational corporations – using open access research to provide the material for monetised, branded and advertising dominated MOOCs – also provides a way for these universities to restructure themselves into competing multinational corporations through what Megan Kimber calls a ‘centre-periphery’ model of exploitation. In this model, early career researchers, recently graduated Ph. D students and migrant academics desperate for a permanent academic post – no matter how little such a post resembles an ‘academic’ contract – provide the ‘human capital’ for entrepreneurial experiments in corporate form and ‘top up’ face-to-face delivery options for MOOCs, while representing a constant threat to the shrinking ‘core’ of relatively secure professors churning out 4* research for REFs and league tables, to be subsequently recycled in the re-branded MOOC and ‘no frills’ teaching material delivered by this periphery. This ‘macro’ process of technological rationalisation is complemented by a rationalisation of the research process itself through the ‘impact agenda’ in both the REF, and in Research Council UK research funding allocation. Within the first REF exercise – which was completed in 2014 – a new metric was introduced: ‘impact’. Although HEFCE – which assesses the REF with the help of academic panels and awards the QR stream of research funding – after some horse-trading between UK government and the research councils took a more “pragmatic” approach to impact assessment with ICRs, moving away from a purely metrics-based approach, the need to ultimately reduce the qualitative content of research to a REF rating (1* – 4*) creates an “epistemological problem”, according to Michael Power. This problem boils down to the difficulty of showing a “causal relationship between independent variables” – a problem particularly acute for social research, which is fundamentally concerned with “reflexive” human behaviour, “where actors may change behaviours as they discover their previous patterns of response have been analysed” – in the face of a fundamental “indeterminacy” of qualitative evidence. Power lists the reasons why solicited testimony is attractive not only for researchers, but also institutions, which, within a marketised environment, are under huge pressure to source as much funding as they possibly can to compete with other institutions (and alternative providers, albeit not in terms of research). Thus, the impact agenda institutionalises at a local level – because of efforts by both managers and academics to play the game – the rationalisation and ultimately scientific management of research imposed by the government. As Harry Braverman explains, such scientific management – inspired by Frederick Winslow Taylor whether this influence is acknowledged or not – is necessary when firms or organisations reach a certain size and level of complexity. Typically, this is not a smooth process, as this involves the removal and alienation of the worker from the qualitative aspect of his or her work. Taylor himself formulated his ‘scientific’ theory of management out of his own experience of being a foreman at the Bethlehem Steel Company in the late 19th century, where the establishment of his revolutionary techniques took, in his own words, “three years of hard fighting” (Taylor, in Braverman, p. 97). ICRs are a prime example of Taylorism. An epistemological problem concerning the process of rationalising the research process is set by government – whether on purpose or by accident is entirely irrelevant – which is then solved by institutions themselves. This is certainly true of the REF. As the case of Imperial College London biologist Stefan Grimm shows – who tragically committed suicide after “struggling to fulfil the metrics” imposed by his institution – academic performance management is experienced by academics as an absurd administrative burden that bears no relation to the individual, intrinsic value of research. Yesterday lunchtime the Birmingham City University University and College Union (UCU) branch protested plans by Birmingham City University (BCU) to force academic staff in its Education Development Service (EDS) to apply for lower paid non-academic jobs. EDS staff provide courses for BCU teaching staff to develop and reflect on their teaching practice – including the increasingly compulsory HE teaching qualification, the Postgraduate Certificate in Teaching and Learning (PGcert). BCU UCU told HE Marketisation that the EDS was facing a “restructure and a 34% budget cut”, with “no guarantee there will be no redundancies” for over 20 members of staff concerned and senior lecturers in the Service facing a pay cut of £3000-£5000 per year. It was ironic, BCU UCU added, that the planned restructure came at a time when the University was trying to get a Gold rating on the next Teaching Excellence Framework (TEF). Not only is the PgCert now a requirement for many HE academic posts, it is also the main way to become a member of the Higher Education Academy (HEA), the “national body which champions teaching excellence”. In response to the last TEF exercise, the HEA said it “continued to propose teaching qualifications and continuing professional development (CPD) as measures of teaching excellence”. More importantly, the HEA encourages teacher trainers in HE to undertake research, and recognises that such research by teacher trainers provides the foundation for teaching qualifications and CPD. “It’s very disturbing that in the future we will be taught these qualifications by staff who will no longer enjoy academic freedom or have the time and resources to carry out research,” Forkert argued. The above chart visualises Department for Education (DofE) data tracking median graduate earnings based on subject studied five years after graduation – the longest period such data has recorded so far. Creative Arts and Design are at the bottom of the table, barely reaching the national average for full-time employees of £28,028. Humanities subjects vary in terms of graduate earnings, with education and languages sitting in the middle of the scale alongside the physical and biological sciences. Based on the highest earnings of graduates studying particular subjects, economics and business studies can help students achieve the highest incomes alongside law, while at the top of the scale, medicine and dentistry far outstrips all other subjects in terms of earnings after graduation, with the lowest incomes in those categories being higher than the median graduate incomes of all other subjects. LEO data also reveals that prior attainment – GCSE and A Level results awarded before going to university – is a significant factor in graduate earnings. Gender and ethnicity, particularly when combined, also have a significant effect on graduate earnings. white men and non-white women are particularly striking.” LEO data shows the reality of structural inequality, in particular in terms of class, gender and ethnicity, rather than the effect of ‘choice’ and equality of opportunity. Andrew McGettigan has argued that this kind of data allows higher education to be conceptualised as ‘variable human capital investment’, which is to say as a private investment by individuals in future economic prosperity and an arms length government system for the production of skilled labour to meet the needs of the wider economy. Individuals and institutions are rewarded or punished according to how wisely they invest; education is reduced to cost-benefit analysis. 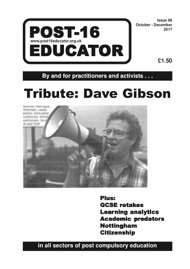 NOTE: Thanks to the University and Colleges Union (UCU) for allowing me to re-use a branch note version of this ‘charticle’ which I wrote as national executive officer for our members. 86.7% of University and College Union (UCU) members at the University of Manchester have voted in favour of strike action after the university announced that 900 mostly academic staff were under threat of redundancy. Academic job losses will be concentrated in three departments, according to UCU. In the School of Arts, Languages and Cultures, 35 posts will be cut from a pool of 104 whose jobs are at risk. In the Faculty of Biology, Medicine and Health, 65 academic jobs are to go with 627 people at risk. UCU pointed out that, according to the Higher Education Statistics Agency, the university recorded a £59.7 million surplus for the year in 2015/16, and the university’s financial statement revealed it had reserves totalling £1.5 billion, of which £430 million was cash. Manchester University management claimed that the cuts were the result of “increased financial, political and sector uncertainty”. “Greater global competition, reductions in public funding, exchange rate fluctuations, the potential decline in student numbers and research income, new private providers, the new Teaching Excellence Framework, the uncertainties of Brexit and further increases in costs arising from pensions and inflation,” were all examples of the uncertainty faced by the university, they argued. Manchester University UCU branch pointed out that the successful ballot showed that the university had lost the confidence of its staff. Academic and professional staff University and College Union (UCU) members at the University of Leeds will be on strike on 11th – 13th October in a dispute about proposed changes to the university statute. Leeds UCU has accused the management at the university of wanting to be able to dismiss staff for undefined reasons, which could include: “‘third party’ pressure from corporations or government if they don’t like research findings” and “sacking employees where there is a personality difference”. Other changes to the statute – the fundamental constitutional and governance provisions of the university and subject to approval by Her Majesty in the Privy Council — include removing the requirements of having a “medically qualified chairs for panels deciding ill health dismissal” and “independent legally qualified chairs for most dismissal appeals”, according to the branch. The dispute at Leeds follows a similar conflict at the University of Warwick, which is also in the process of trying to repeal current provision for redundancy, discipline and dismissal, making it quicker and easier to sack and discipline members of staff at the university. ‘The University of Leeds is insisting on an open ended catch-all power to dismiss staff on the grounds of ‘Some Other Substantial Reason’, posing a serious threat to our member’s job security,” commented Vicky Blake, Leeds UCU president. The strike at Leeds followed a successful ballot in which two-thirds of Leeds UCU members voted to take strike action, once again showing that trade union branches can deliver strikes in a post-Trade Union Bill landscape. Just yesterday, the Communication Workers Union (CWU) delivered an astonishing result, with a 74% turnout for a national strike ballot with 89% voting to take strike action.